Most of the Popes have their tomb in S. Pietro. They have usually a common pattern with the pope in the centre and two statues on the side, but each of them is somewhat unique. A very impressive one is that of Pope Alexander VII, especially for the use of colour and the representation of Death (in the background a detail of the Monument to Alexander VII). The coat of arms is also coloured and is a tribute by Gian Lorenzo Bernini to a pope who shared his artistic views. 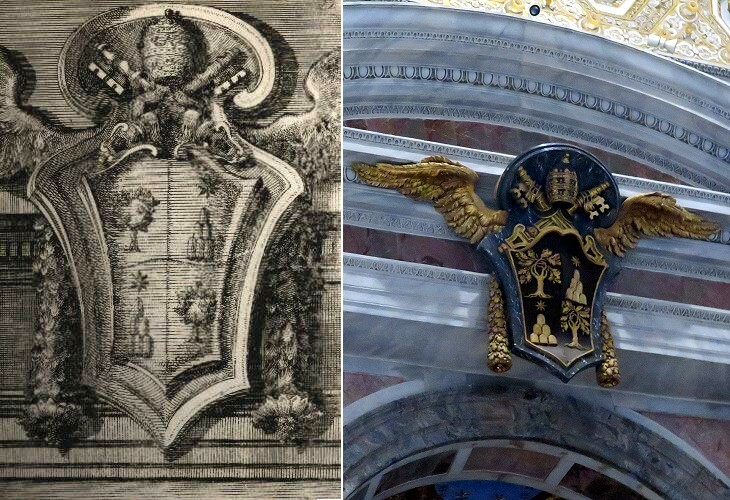 In this case however Bernini was influenced by the coat of arms of Innocent X (plate 30) by Francesco Borromini: the wings clearly come from there.